Well, starting today, it's now possible for you to build your own Street View experiences to do just that. Using a new feature in our Views community, you can easily connect your photo spheres to create 360º virtual tours of the places you love, then share them with the world on Google Maps. Creating Street View from your photo spheres is as easy as connecting the dots into what looks like a “constellation” of stars. You can even connect your photo spheres to our own Street View panoramas. We hope this new feature will enable people to share and witness the beauty and breadth of our planet through Google Maps. Whether you’re photographing exotic islands or your favorite neighborhood hangout, mountain peaks or city streets, historic castles or your town center, we’re thrilled to see the places you love coming to life on Google Maps. Businesses, as a reminder, you can showcase the beauty of your interiors through Business Photos. Updated December 16: Modified use cases for clarity & added reference to Business Photos. Have you ever tried to convey the feeling of walking through your favorite park? 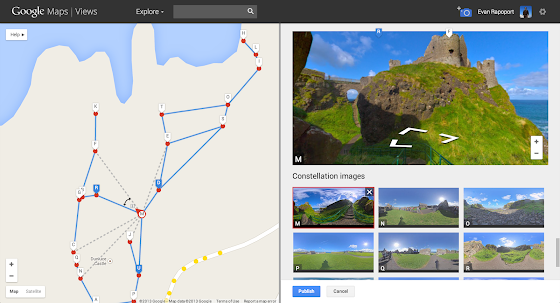 Or have you wanted to create an interactive tour of a memorable journey? 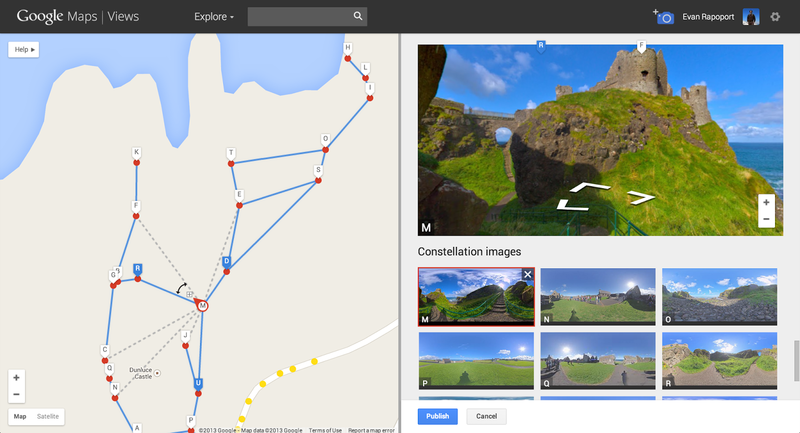 Well, starting today, it's now possible for you to build your own Street View experiences to do just that. Using a new feature in our Views community, you can easily connect your photo spheres to create 360º virtual tours of the places you love, then share them with the world on Google Maps.